Each issue of Energy Manager focuses on one most appropriate topic of contemporary relevance on energy efficiency and energy conservation as its cover feature, with a national/ international domain expert as the guest editor. 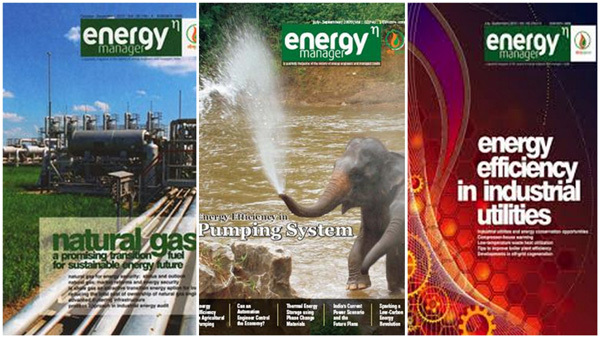 Other regular columns include best practices, research and innovation, renewable energy, energy management, energy audit, global focus and focus India among others, contributed by some of the leading personalities in the energy sector. energy? manager is circulated among a focused audience of about 5000 including State and Union Ministries of Power, New and Renewable Energy, Industries, Agriculture, etc, Forum of Regulators, State Electricity Boards, Energy Development Agencies, Power Generation, Transmission and Distribution Agencies, Energy Development Agencies, Energy Intensive Industries, Energy Service Companies, State Designated Agencies, Industry Associations, Designated Consumers, Energy Consultants, Energy Auditors and Managers, etc, Energy Researchers & Academicians, Engineering & Technical Institutions, Consultants, Planners and Architects, Energy Equipment Manufacturers, Distributors and Marketing Agencies, UN agencies and other International Organizations. Business Magazines of India help you follow news updates about business. They publish market and business updates every month with articles about the corporate leaders, technology, wealth and finance, current affairs, business performance management, business mthodologies, metrics and processes, Solutions for financial executives, legal news, global economy, Energy Managership, News, opinion, and community for business leaders and investors, industry features, interviews, market briefings, reviews of books, feature columns, screening tools, Corporate responsibility and social investing report, international issues, database and corporate governance resource, latest data and trends on customer service worldwide and even more.